The last and most important stage of the RRB ALP Exam 2018-19 is also the toughest one - RRB ALP CBT 3 - Psychometric Tests/ Aptitude Test. 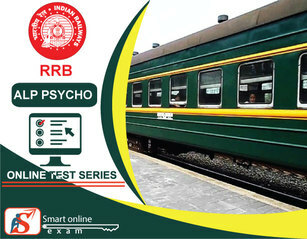 RRB assistant loco pilot psychological test is an important section of Assistant loco pilot Recruitment process. A best practice to score well In RRB ALP is by maintaining an efficient study Schedule. The RRB ALP recruitment process will take place for 26502 Vacancies. The test is conducted for check your mind presence and how quick you are get decisions. Designed in 5 batteries (Sections) and several tests per battery, this exam will be the toughest challenge of your life, as it will check your memory, perception, concentration, speed, as well as your ability to follow directions. Each test will be of 5- 10 minutes. You have to be very quick for doing 50 or more questions in 5-10 minutes. To help you overcome this challenge, Smart Online Exam is bringing to you RRB ALP CBT 3 Psycho Test/ Aptitude Test. Only practice can lead you to success in ALP Psycho test. ** New Topic Added as per new Pattern. 15000+ Questions in this Package. *** Retake available after complete all tests.